Soooo yesterday was my mom's birthday and I purposely didn't write a birthday post because this week I was planning on going home for vacation. AND on said vacation I was planning a big birthday/girl-time celebration fest which would be followed by a big post with lots of pictures of us on the beach getting all brown-sugared up, eating ridiculous yet scrumptious things like shrimp burgers and ice cream with chunks of raw cookie dough and sprinkles in it and watching movies while reveling in vacation glory. Reveling I tell you! But there is a nasty nemesis that emerged in my sparkles and sand kisses beach vacation plot..His name is Weather and he's packing a freaking cold front and 70% chance of thunderstorms on my vacation days...every.single.one.of.them. So now I just look like a bad daughter for not posting about my mom on her birthday. Thanks Weather. Anyway, since vacation is being cancelled or (maybe just delayed?) and there will be no vacation-reveling, today, though it's a day late, I thought I'd post about my awesome mom...who also happens to be one of my best friends. My mom is the most caring person I know. At any point in time I can usually tell you what someone in my family is struggling with or hoping for..but never her. She is the She-rock of our family. (My dad being the He-rock.obviously). She taught me alll the essentials growing up such as you never wear white pants before easter, aluminum foil can in fact not go in the microwave and "you can have the prettiest outfit on but a chipped mani can ruin it all" (very important). And we somehow found ourselves always laughing when we're together. Happy (belated) birthday mom! Love you! Sorry about the bad weather ruining your plans. Happy belated your mom! Happy Birthday to your mom! You both are just too pretty! love the sprinkle post! happy birthday to your mom! You and your sister look SO much like her - gorgeous! I'm digging the bathing your mom was wearing!! Happy birthday to her! Happy birthday to your mom! She is a beautiful lady. Hold S she's fashionable. Her bathing suit is to die for! happy birthday to your mom!! what cute pictures of the two of you! I hope you get to have your vacation! Happy birthday to your mom! I hope you get to go visit soon! I love getting to spend time with my mom! It is the best!!! Praying for hot sunny weather for you! Lol I love this post Ashley! Your Mom is a TOTAL babe!!! No wonder you're such a smokeshow! Your whole family is gorgeous! Can I join so some of that pretty powder can rub off on me!? PLEASE!? :) I am sorry about your weather! It's crappy here too...what the hay!? Here is to wishing and hoping it clears up soon so you don't have to spritz yourself with salt water lol. Love you! P.s.) Tell your Mom Happy Birthday!!!! :) I totally forgot this in my comment. Shame on me! Happy Birthday to your mom! What a good lookin' family! Your mom is a KNOCKOUT! No surprise though because you are too!! WOW family genes ahahahah so sorry about vacation..I totally feel you there. but happy birthday to that fox mom of yours! Happy belated birthday to your mommy!!! I'm sad your vacation plans got ruined :( Stupid weather. What a freaking bummmmmer for the weather! :( Sorry to hear that girlfriend! Hope you can reschedule it ASAP! Your parents are SO cute, good genes in that family for sureee!! Aw this is too sweet! Happy birthday to your mama! Ps. 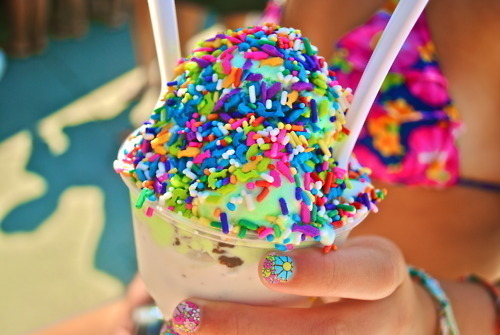 I'm really wanting me some of that sprinkled icecream. Omg. Happy birthday to your mom!! I love that she's one of your best friends! My mom is one of mine too. I wish I got to see her more!! your mom is a stunner! that bathing suit she is rocking is to die for! no wonder you are so stinkin cute! your mom=FABULOUS! you all look so much alike!!! happy birthday to her!!! i love all the sweet words you said about her :-) and the chipped mani. YES important info! haha love it! i love that you have such a great relationship with your mom!! So so sweet ashley! That is a huge bummer!! That happened to me a few years ago and I was so miffed about the whole thing for days! Your mom is gorgeous, by the way! Checking out your blog, and I gotta say I love it. Stop by and say hi sometime lady! Happy birthday to your mom!!! What a beautiful lady. I'm sorry about your weather!! aww, i LOVE this post so much!! are you still coming home this week? Happy Birthday to your gorg Momma! awww happy bday Mrs. Kriegs! Your mom is the cutest thing ever (As are you duh). I'm pretty bummed for you about the cancelled vacay. Maybe weather will be on your side next week. Should I call and ask it? Happy belated to your mother! You two look great! And sorry about the weather not playing nice! i love your mother and have always looked up to her. she is beautiful and her love for her family and for the Lord has always been so evident! beautiful post, friend! i'm sorry to hear about the bad weather BUT you and your momma are so adorable! Well since I just read your most recent post I know that you are on vacay now! Woohoo! Love the post! Your mom is beautiful and truly sounds like a wonderful person! Happy Belated Birthday to your gorgeous Mom! Holy wow was your whole family blessed with stunning looks!! Your moms outfit in the jean capris - love it. She looks awesome! Your mom is adorable! That pic of her in the swimsuit reminds me of Jackie O, and that's a good thing.